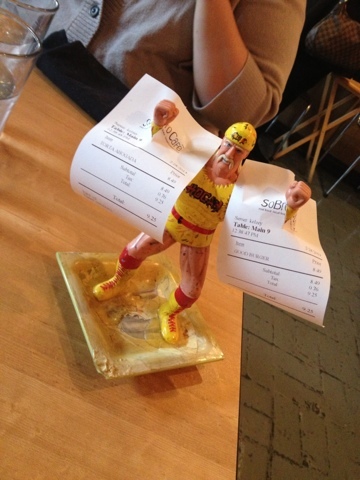 I met my friend Lydia for lunch at Sobro Cafe today and it was as delicious as expected. This little cafe features internationally-inspired food that is generally healthy - they also offer several vegetarian and vegan dishes ... and all of the food is created from scratch (except for the bread and sweet potato fries)! Lydia and I tend to split meals when we go out to eat so that we can try more foods from any particular restaurant - we had The Good Burger, a veggie burger with avocado and sprouts on a pretzel roll, and the Torta Ahogada, pulled pork sandwich with sauteed onions and peppers and ahogada sauce. Combined with homemade potato chips, I have to say it was a delightful meal, particularly the Torta Ahogada! Lydia and I are no strangers to local northside and downtown restaurants - so much that we have a rating system that we use to evaluate our new finds (ratings are 1-4, 4 being the best). Overall, I love the idea of the restaurant - made from scratch, unique food offerings and a great atmosphere. The food and prices didn't blow me away, but I will definitely go back to try something new!